Is TV social again ? 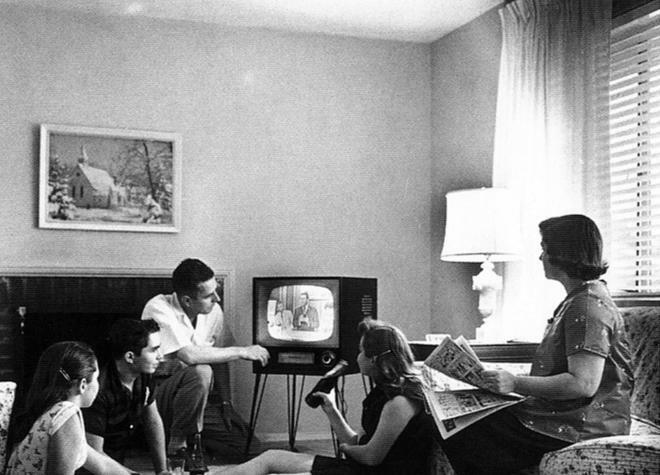 Since the 1990s, ethnographic research has shown that, contrary to the popular belief, watching TV is far from an isolating, antisocial, experience. The content of the shows takes direct part in the social interaction while watching TV and an indirect part during later social gatherings. In parallel, many elements of contemporary life in more developed societies, from urban sprawl to busy schedules, create time and distance roadblocks which limit this social interaction. Social Media offer one of the latest of several initiatives proposed to bring back the social value of TV. This emerging trend ties TV shows to social media activities by involving social media users in the programme (Al Jazeera – The Stream), creating Facebook pages, Twitter accounts, or promoting Twitter hashtags specific to the shows. Through these social media channels, people can interact with the show and each other around the show’s content. The obvious benefit is a more engaged audience that is contributing to the show; but it shouldn’t stop there. The richness of the data uncovers the viewers’ emotions, preferences, needs, wants and behaviours. Hashtags on Twitter are both public and, for the most part, focused on the content of the show making the process of identifying the relevant content from the noise easier. In a series of blog posts, starting with this one, we will present the analysis of this content while using the show “First Dates” as a source of data. For those of you outside the UK , or not that much into TV, First Dates is a British dating show on Channel 4. The show takes place in a restaurant where couples are arranged to meet for their first dates. The camera moves from table to table and captures the awkward, funny, and surprising moments of the dates. While snooping on listening to and watching the private conversations of strangers is interesting, what really piqued our interest is the show’s adoption of the Social TV trend and specifically the hashtag “#firstdates”. 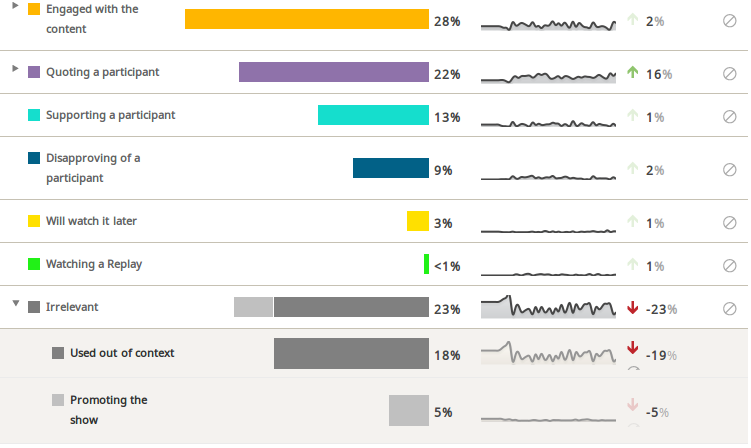 This offered us a great opportunity to observe how viewers used Twitter in their interaction. In this first post, we will use Crimson Hexagon’s Forsight platform to source the relevant data and perform our initial analysis. The first episode of the second season of First Dates was aired on 12 Feb 2014 so we set our analysis to start on the 1st of Feb to detect any build-up to the show using only the hashtag “#firstdates” as a keyword. 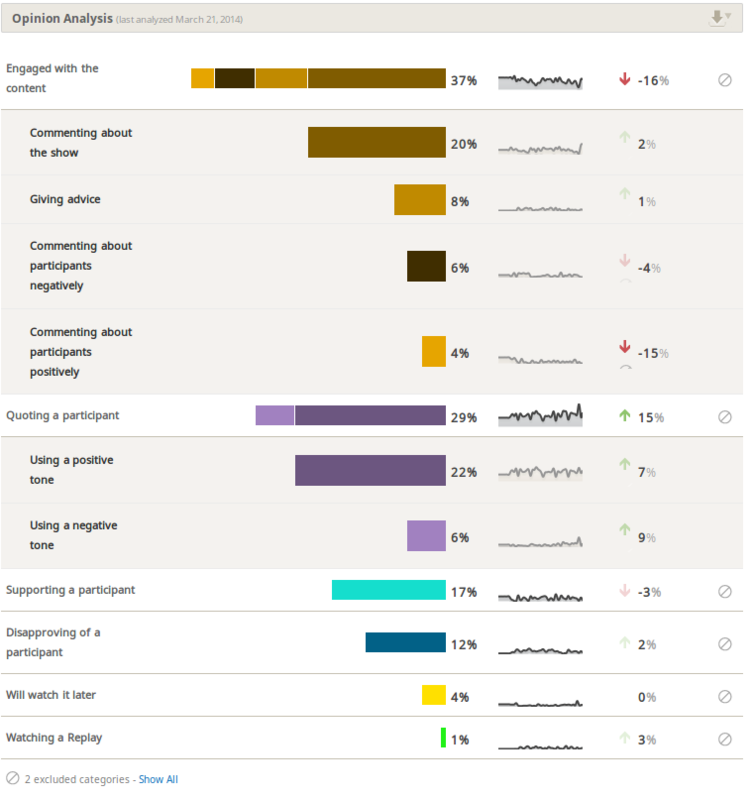 “Engaged with the content” includes posts actively commenting on the content being funny, sad, emotional, even giving advice to the participant as one would do when very connected with the show. “Quoting a participant” includes posts directly quoting individual participants and adding the viewers’ emotional reaction to the quotation. “Supporting a participant” includes posts voicing support for a particular character on the show whether wishing for them to succeed or stating they are funny. “Disapproving of a participant” includes posts naming certain participants because they are annoying, rude etc. “Will watch it later” includes posts mentioning intent to watch first dates on replay at a later time. “Watching a Replay” includes posts stating that viewers are watching First Dates on catch up. As a side note, the above categorisation of the content is done for all 60,740 posts and not based on sampling. From this division of content, we can see that the viewers’ reactions on Twitter bear a strong resemblance to those they would have in their living rooms while watching the show. The snippets shown below are examples of this reaction. Is it a sustained interaction? First Dates episodes aired every Wednesday on 12 Feb, 19 Feb, 26 Feb, 5 Mar, 12 Mar, and 19 Mar. 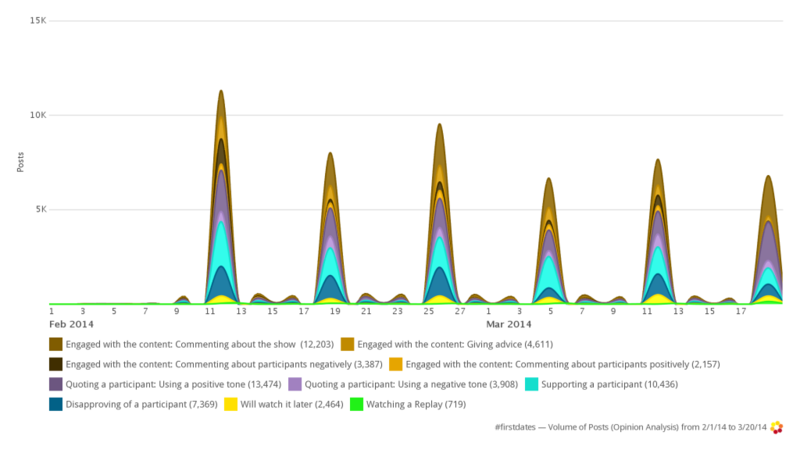 The peaks in the conversation are aligned with the dates when the show was broadcasted which validates that the hashtag is part of viewers social interaction during the show (the graph is displayed every two days but the data is analysed daily). More interesting is the two small peaks that happen on the following Friday and Monday. These two peaks seems to indicate which days that viewers catch up on First Dates reruns and that they still use the hashtag to socialise. In contrast, the hashtag saw very little activity during the buildup to the show and beyond the days when the show is aired. This trend points to an opportunity to capitalise on the show’s social followers beyond the time they are watching TV to increase reach and adoption as more of the audience jumps on the Social TV bandwagon. Is Social TV a reality? The biggest takeaway from this analysis is that users indeed socialise around programme content and will use the hashtag in a way that mirrors their offline behaviour. They react, comment, support and berate the characters and talk to their Twitter group as if it was with them in front of the TV. The resulting data, while influenced by being public, is more spontaneous and less biased by the observer. Equally, the data provides the metrics to evaluate uptake, benchmark, and perform more rigorous statistical analysis of user and content trends. As an initial evaluation, we saw that viewers are using the hashtag mainly on the day the show is broadcasted and to a much lesser extent when they catch up with the show. In future posts, we will take a more analytical look at First Dates’ Twitter dataset to identify any statistical trends for the users and the content. We will also benchmark First Dates with the shows that generate more hashtag volumes.